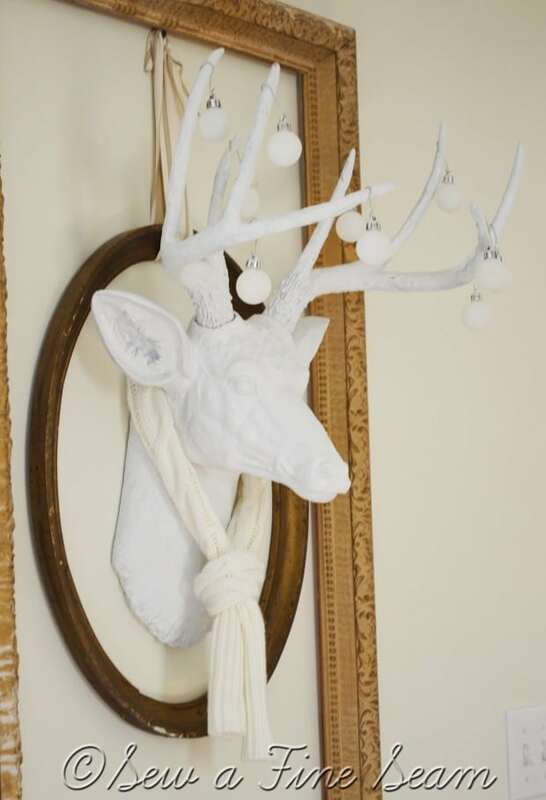 Oh Deer… my faux white deer is just so much fun to have on my wall this Christmas! He proudly and silently wears his holiday decor as he reigns over our living room. The little white balls were from last years tree. His scarf I made especially for him from the sleeves of a thrifted sweater. Maybe next year I’ll spring for a string of battery-powered lights to deck his rack!! Do you decorate for Christmas? Do you have all of yours done yet? You know I loved your deer the first time! I love it even more decorated for Christmas! Have a great week! Thanks Leslie! He is enjoying his holiday bling a lot!! 🙂 I will have to see what we can come up with for Easter !! LOL! Thanks Diana – and I hope you slept well! Love it Jill! Such a smart idea for his adorable scarf! Thanks Jennifer – glad I thought of making him a scarf – none of mine were working cause they were too big. 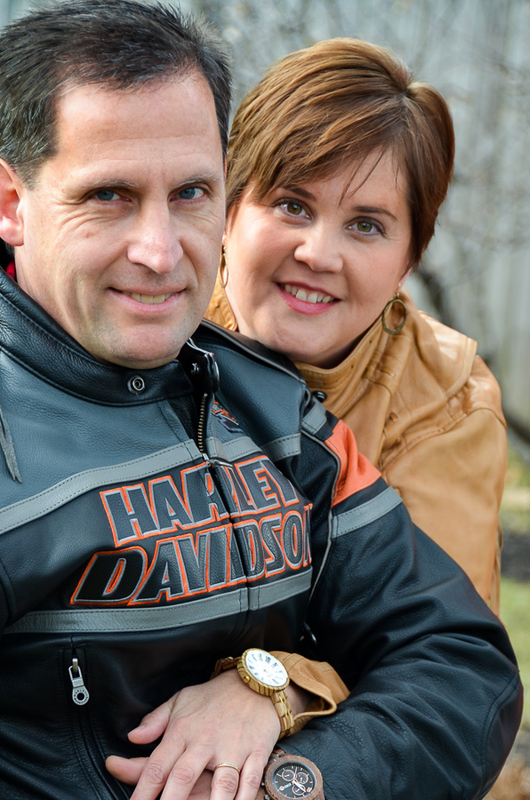 Thank you Pam – his so much fun 🙂 The typewriter is being borrowed for a wedding this weekend so I will need to find something to take its place for a few days! His scarf is too cute! 🙂 I kept thinking he needed a scarf but didn’t have anything that would work – finally figured out that it needed to be smaller and not a print so I made this one! Darling deer! The scarf adds so much! I have really just began decorating for the season. As the first day of Christmas starts on the 25th and ends on the epiphany (Jan. 6th) I am in no rush. I hope your day is magical. Thank you Laura! My decor will stay up for awhile – we are traveling over Christmas this year and won’t be back till the first of 2013. My box from you arrived today!!!!! I was so excited! So much great fun stuff! I don’t think I can bring myself to use that beautiful towel from sur la table – it just might find itself repurposed into something else really fun! and the necklace!! My daughter is dying to wear it – might let her use it for her Christmas necklace. And the little bracelets for the girls – so sweet and so cute – I just love them and they were thrilled!! You are wonderful dear friend! I just LOVE that!!! 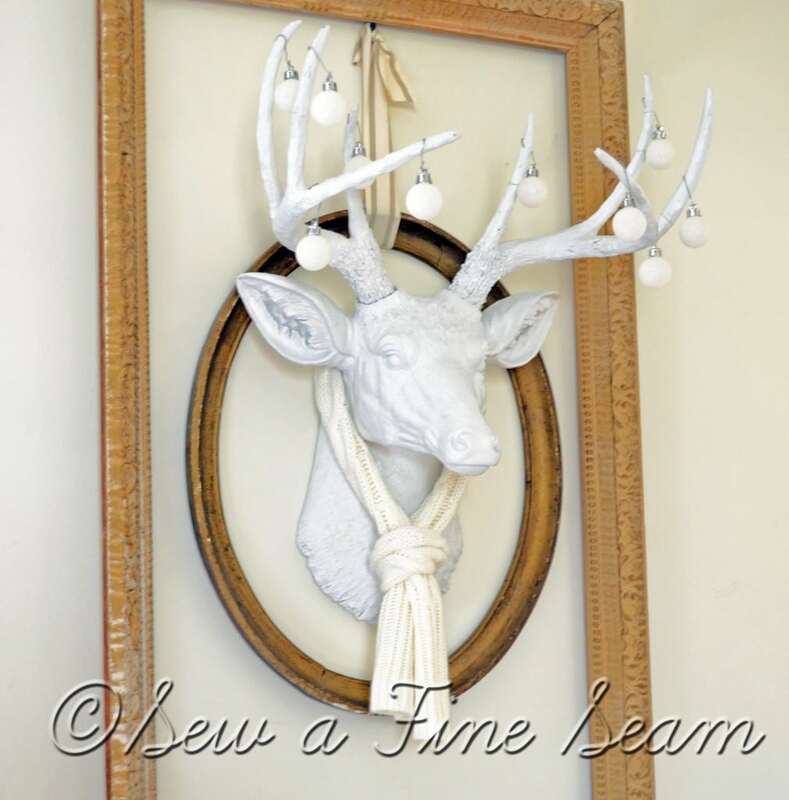 I’ve been seeing deer heads inside wreaths or frames like this around blogland and I’m very smitten with the look. Yours looks great with the knitted scarf you made. You’re so clever. 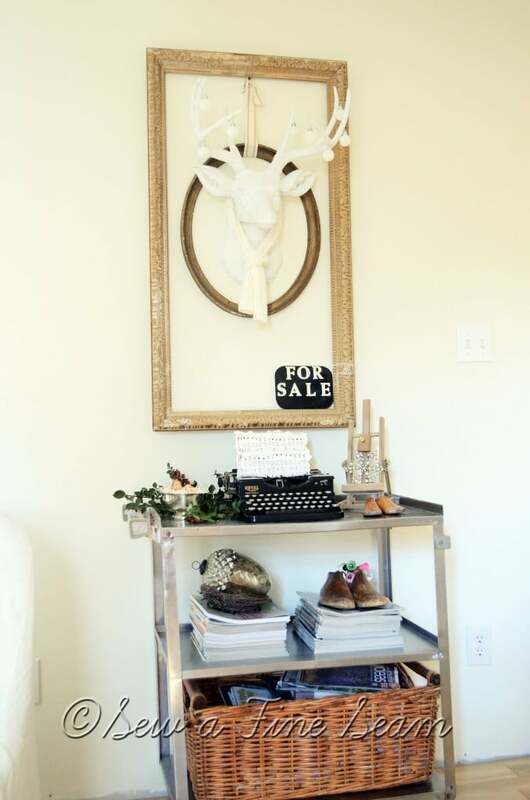 I love a touch of whimsy like this in a home. It keeps things fun. Thank you Kelly! It’s funny cause when I stuck him in those frames I hadn’t seen the idea anywhere. Now I see it everywhere! Great minds think alike I guess! Or else it just pops out at me now! I’ve so been looking for a guy like him for my basement. Fingers crossed. I’m sure you can find one somewhere eventually!! Oh my this is the most amazing head ever. Where ever did you pick him up? 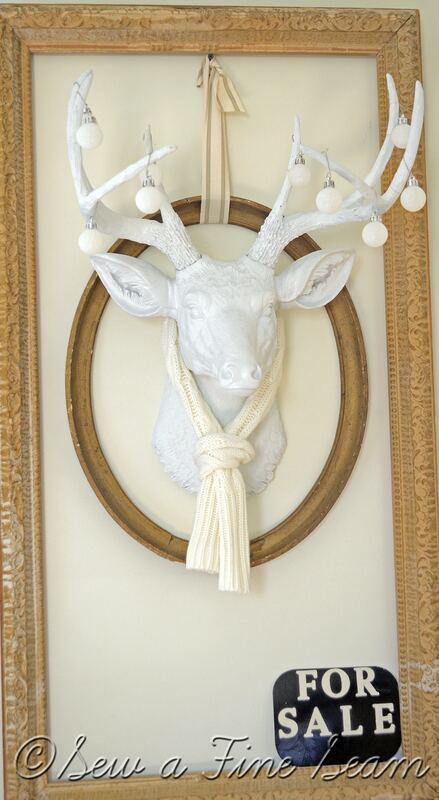 I have a pair of antlers in my room but they are baby size…yours is so much more substantial. and super cool. 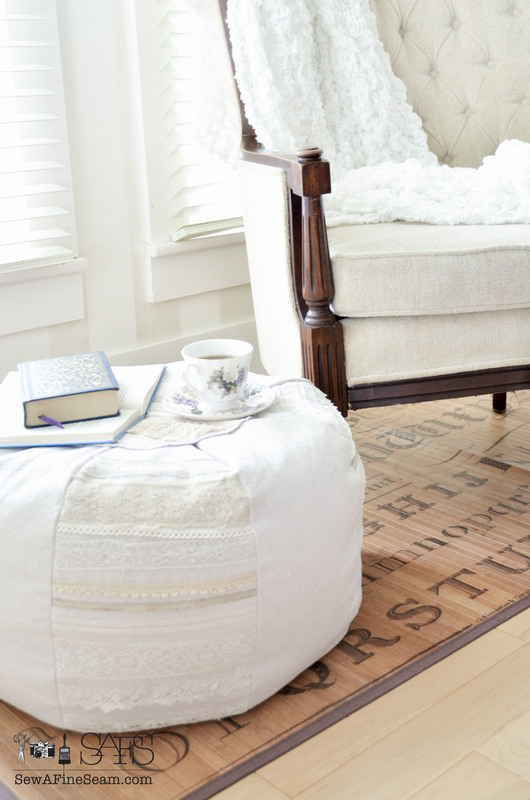 Your decorating vignettes are wondeful. Thanks for stopping by my blog and leaving me such a nice comment. Awh!! I love you deer!! And of course I love your decor too! So perfect!! You had better take down that for sale sign before your open house!!! Someone is going to get excited thinking they can buy him!! Yes, I suppose I’d better take the sign down before Saturday! I will put it on something that IS for sale! Jill, you make me laugh. 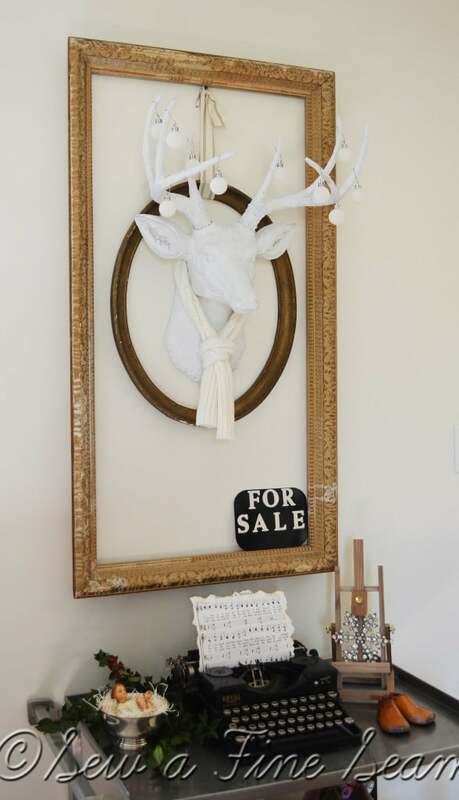 I love in your beautifully decorated home you have a bit of whimsy to your decor. Your deer looks lovely, warm and ready to celebrate. Thank you Amy! I always love to get your sweet comments! So fun! Hi! I’m your newest follower and was kinda maybe sorta hopin’ that you’d hop on by my blog and follow me back!! Hi Sarah! Your comment got stuck over in my spam – but I fixed that! I’ll be by your blog! Love this! And love the typewriter, too! I’ve been looking for one. Thank you! I found that typewriter this summer for $20! I was so excited! I should hang him and decorate him! Hubs would get a kick out of that!! The scarf is great, too! Wonderful idea! Starting to decorate tomorrow! Can’t wait! Thanks for joining in Blissful Whites Wednesday, too!!! Oh Becky! I want a real deer head so bad! I’ve wanted one for all the 15 years we have been married. Get that guy on your wall and get him blinged out! Oh the ideas I’ve had for decking out a real one! 🙂 Sorry – but you DID tell me I needed to post new pics of him in his holiday accessories!